Sunscreens are an important part of your sun protection program. The problem is many sunscreen ingredients include carcinogens, hormone disruptors, nano-particles, allergens, harsh preservatives and skin irritants. These can negatively impact people, aquatic and marine life. Sunscreens protect your skin by absorbing and/or reflecting UVA and UVB rays. 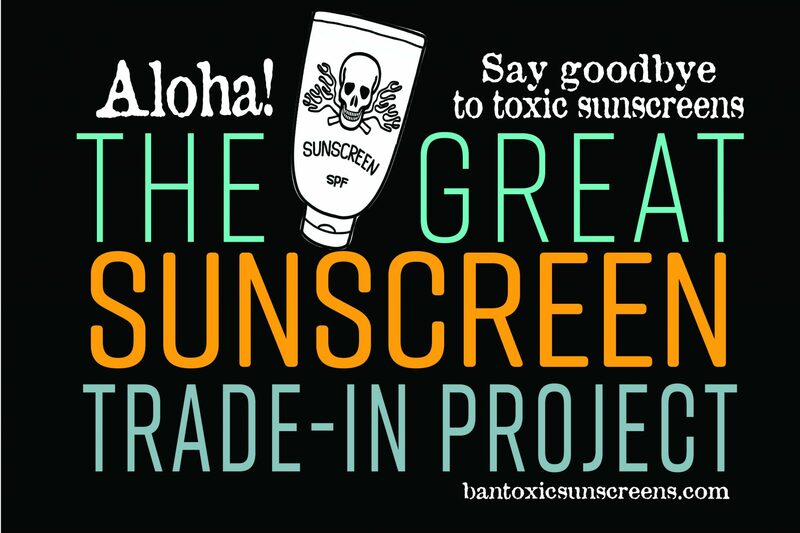 Our objective is not to dismiss the value of efficient, safe sunscreens (in fact we help steer you to many safer more effective formulations), but to educate about the potential dangers of sunscreens with toxic ingredients and encourage education and legislation to protect people and the environment. Oxybenzone (benzophenone-3) is a common chemical UV filter and known endocrine disruptor. One full body application (one ounce) of average chemical sunscreens provides the equivilant to a dose of hormonal replacement therapy for menopausal women. Within thirty minutes of application to the skin, these estrogenic compounds are found in the urine and bloodstream. Oxybenzone mimics estrogen in the body. Benzophenones, also found in plastics, bioaccumulate and contaminate 97% of Americans according to the CDC. WINTER Edition: SAFE Sunscreen BOX! People across the islands, including visiting tourists, are trading in their toxic chemical sunscreens for samples of safer broad spectrum mineral sunscreens. Find the latest Hawai’i trade-in events! Get your brand involved. WE GOT THE SUNSCREEN BILL PASSED! See an archive of the Hawai’i legislation blog and how it all progressed. We’ll be updating with new sunscreen legislation around the world! Links and database of studies related to common ingredients found in sunscreens and their effects on people, marine life, and corals. Check back for regular updates. We’re a social movement of concerned citizens working to educate on the dangers of toxic chemical sunscreens to people, corals, marine and aquatic life. We worked for three years advocating for sunscreen legislation in Hawai’i. Not a non-profit (but we appreciate your support). Spring 2019 Safe Sunscreen Sampler Box - featuring Cacao!